Get from SFO to Monterey and back with our affordable domestic shuttle service! A Monterey Airbus is the easiest way to catch a flight from domestic flight out of San Francisco Airport. 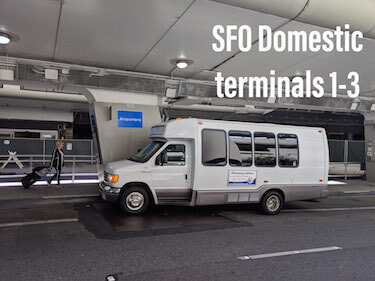 Our shuttles from Monterery to the San Francisco domestic terminal run daily, but check out our full schedule of SFO airport shuttles for domestic flights. Click here for more information on SFO Airlines or book a SFO shuttle with Monterey Airbus for your next domestic flight! (Terminals 1, 2 & 3) - Cross the street from lower level baggage claim to the blue post on the center island labeled "Airporters". Review the videos belong to learn more about Monterey Airbus domestic pickup location at SFO. Whether you're headed to Monterey or San Francisco Airport, Monterey Airbus provides timely and stress-free transportation, the perfect way to start or end any trip. Our scheduled shuttles for SFO domestic flights run all day with additional stops at San Jose and throughout the Monterey Bay area. 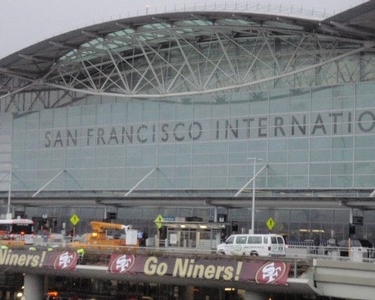 The SFO domestic pickup spot for terminals 1, 2, and 3 is located across the street from lower level baggage claim. Then find the blue posts post on the center island that is clearly labeled "Airporters". Or review the pickup and drop off videos above for more information. 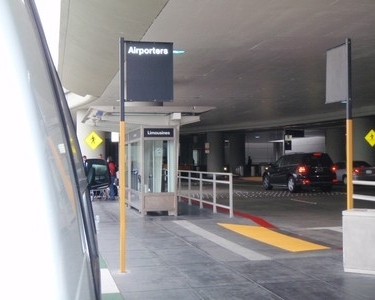 From San Francisco International Airport, Monterey Airbus provides schedule drop offs and pickups at San Jose International Airport, Prundale, Marina, and Monterey. Our Monterey to San Francisco shuttles are great for anyone visiting Monterey or leaving through San Francisco. Looking for private transportation or luxury sedan? Besides the shared ride airport shuttles, we can also provide door-to-door shuttle services from SFO to Monterey. 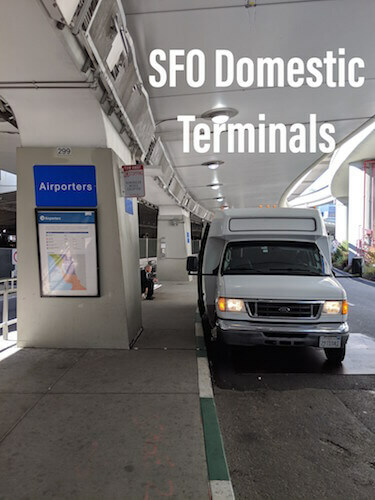 If you’re not looking for a shuttle van or airbus, private sedans and limousines from SFO are also available. Reserve your next shuttle bus to the San Francisco domestic airport with Monterey Airbus!